San Bernardino shooting: Syed Farook reportedly had contacts suspected of terror ties. 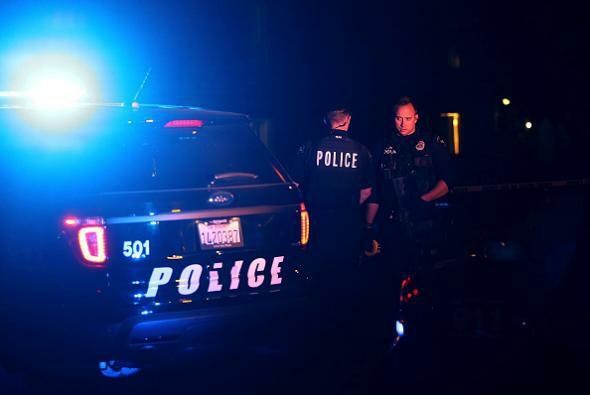 Police officers in Redlands, California, investigate Wednesday’s shooting in San Bernardino. Update, 7:35 p.m.: After notifying the families, the San Bernardino County coroner’s office released the names of the 14 victims killed on Wednesday. The Los Angeles Times has more info on each individual and is in the process of compiling biographical sketches. Update, 1:10 p.m.: Police say that 12 pipe bombs and “thousands” of rounds of ammunition were found at Farook and Malik’s home. It’s been previously reported that three undetonated bombs were found at the Inland Regional Center after Wednesday’s attack. Update, 12:50 p.m.: Citing “law enforcement officials,” CNN reports that Syed Farook “was in touch over the phone and via social media with more than one international terrorism subject who the FBI were already investigating.” Farook, who was Muslim, may have been “radicalized,” the network’s sources say. Police believe the shooting was carried out by 28-year-old Syed Farook and 27-year-old Tashfeen Malik, who were married. Both were killed Wednesday in a shootout in San Bernardino after they were initially located in nearby Redlands. Syed Farook is a U.S. native of Pakistani ancestry who worked for the San Bernardino County Public Health Department, which was holding a holiday banquet in a room at the Inland Regional Center that was attacked. He’s believed to have attended the gathering and left after a dispute before returning with his wife and opening fire. A third person was taken into custody Wednesday around the time of the shootout with police, but San Bernardino police chief Jarrod Burguan says it’s not clear whether that person was involved in the attack. Weapons used in the attack are believed to have been purchased legally. Farook and Malik were dressed in “tactical” combat gear—black clothes and masks—suggesting that the attack was at least somewhat premeditated. The couple, who may have met online, is survived by a 6-month-old daughter.